The macula is a critical part of the eye and is responsible for detailed vision. Although very small, the macula has the highest concentration of cells in the retina. These particular cells are called photoreceptors and are responsible for converting light into electricity. Photoreceptors allow focused vision, necessary for reading, seeing faces, and drive cars. Damage to these cells is the cause of vision loss in macular degeneration. The area of the retina, just outside the macula, is responsible for peripheral vision and is unaffected by macular degeneration. This area has much lower resolution but allows us to see larger objects. Therefore, patients with macular degeneration will never go completely blind. Macular degeneration comes in two forms. 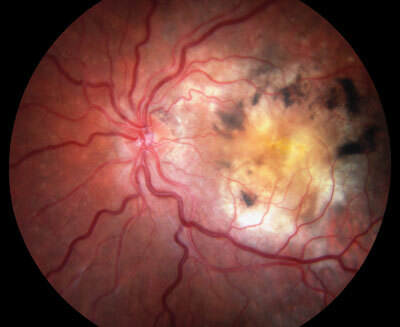 In the dry form of macular degeneration, tiny yellow deposits develop beneath the retina, called drusen. Areas of thinning, called atrophy, may also occur. Approximately 10% of patients with dry macular degeneration will experience enough damage to develop the second form of the disease, called wet macular degeneration. In this form, abnormal blood vessels grow beneath the retina in an effort to bring more nutrients to the diseased tissues. However, these abnormal vessels often leak and form scar tissue. This can be the cause of permanent central vision loss if left untreated. Early signs of wet macular degeneration include central vision distortion, characterized by wavy lines and dark or missing areas of images. An Amsler grid is useful for detecting these initial changes. When diagnosed in the early stages and utilizing the latest technologies and treatments, it is possible that vision might be preserved or restored. Therefore, patients with macular degeneration should monitor their eyesight with an Amsler grid, daily, and visit their eye doctor on a regular basis. Macular degeneration is caused by a number of factors including, but not limited to, age, genetics, and increased oxidative stress on the eye. Specific risk factors include advanced age, genetics (heredity), race, smoking, exposure to sunlight, diets high in saturated fats and cholesterol, little exercise, vascular disease, high blood pressure, and farsightedness (hyperopia). While age and family history are unpreventable, one has the ability to reduce some of the other risk factors. It is important to work with your medical doctor and eye doctor to make these changes. There are a number of factors, within your control, that may help reduce the risk of developing macular degeneration or reduce the progression of a diagnosis. Specifically, one should consider protecting themselves with UV light resistant sunglasses, exercise, vitamin supplementation and a healthy diet. Vitamins have been shown to reduce disease progression by up to 25% while diet may reduce progression by up to 50%. Specifically consider supplements that follow the guidelines set by Age-Related Macular Degeneration studies and modify according to your age, disease severity and medical history. If possible, your diet should include the consumption of green leafy vegetables and fish, at least twice a week. Avoid eating red meat or processed baked goods more than once a week and avoid smoking and sleep deprivation. Omega 3 fatty acids should be consumed once a day along with regular exercise, under the direction of your medical doctor. Dry macular degeneration is treated with the preventative guidelines noted above. For the treatment of wet macular degeneration there is a host of new options. There are injections available to stop or reverse the growth of the abnormal blood vessel, which causes leakage and vision loss. In some cases, surgery may be recommended. Clinical studies are now underway to assess new treatments. The goal of treatment is to reduce or stabilize vision loss. In select patients, particularly those diagnosed early, dramatic improvement in vision may be possible. We specialize in the newest restorative therapies, here at the Retina Macula Institute.